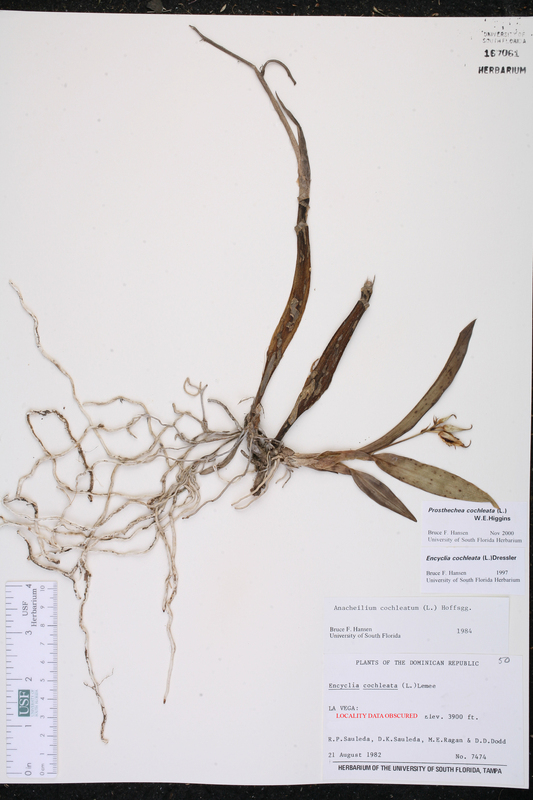 Citation PROSTHECHEA COCHLEATA (Linnaeus) W. E. Higgins, Phytologia 82: 377. 1998 ("1997"). Basionym: Epidendrum cochleatum Linnaeus 1763. Type: HAITI: Without data (lectotype: Plumier, Pl. Amer. t. 185(2). 1759). 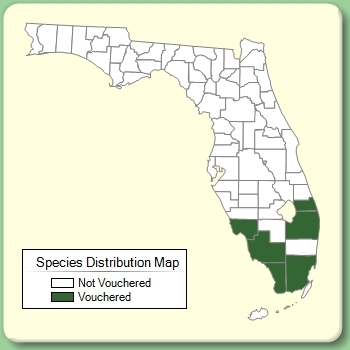 Lectotypified by Garay, in R. A. Howard, Fl. Less. Antill., Orchid. 130. 1974. 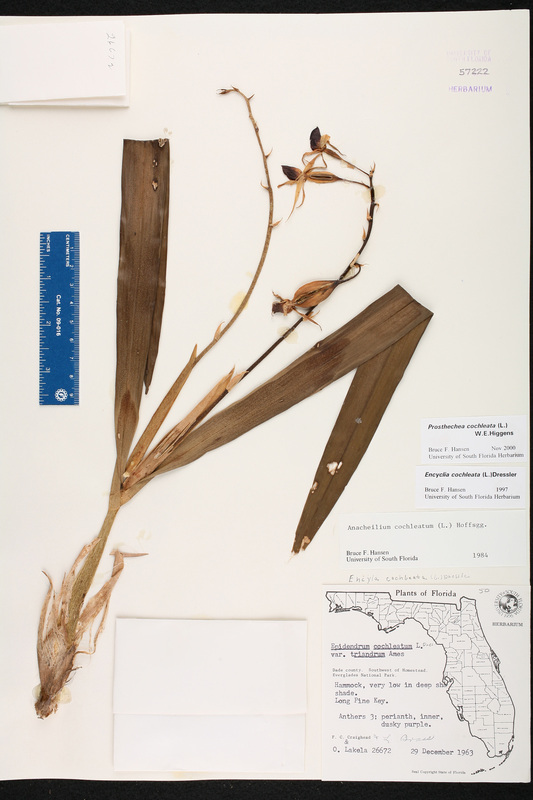 Martin Lit Lit: Roberts et al., Florida Sci. 69: 307. 2006. Palm Beach Lit Lit: Calkins, Rockford Daily Register 29 Jun 1881. Anacheilium cochleatum Anacheilium cochleatum (Linnaeus) Hoffmannsegg, Linnaea 16(Litt. Ber. ): 229. 1842. BASIONYM: Epidendrum cochleatum Linnaeus 1763. Anacheilium cochleatum var. triandrum Anacheilium cochleatum (Linnaeus) Hoffmannsegg, var. 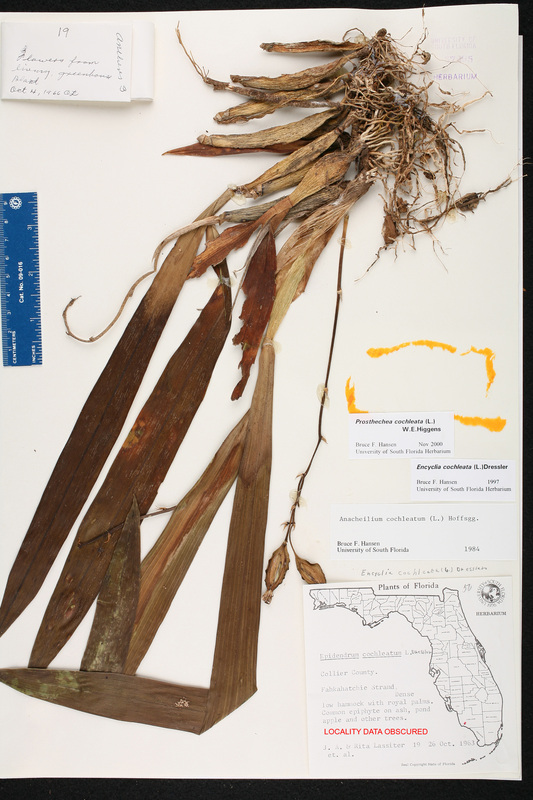 triandrum (Ames) Sauleda et al., Phytologia 56: 308. 1984. 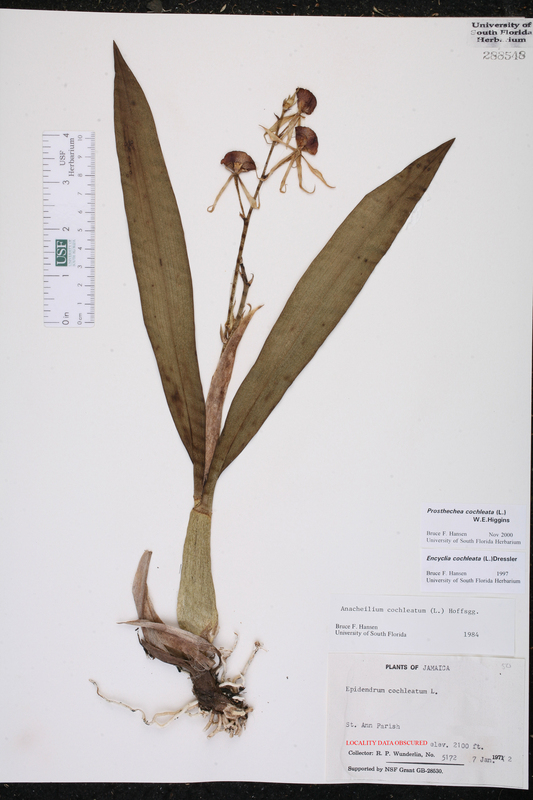 BASIONYM: Epidendrum cochleatum Linnaeus, var. triandrum Ames 1904. Encyclia cochleata Encyclia cochleata (Linnaeus) Dressler, Brittonia 13: 264. 1961. BASIONYM: Epidendrum cochleatum Linnaeus 1763. 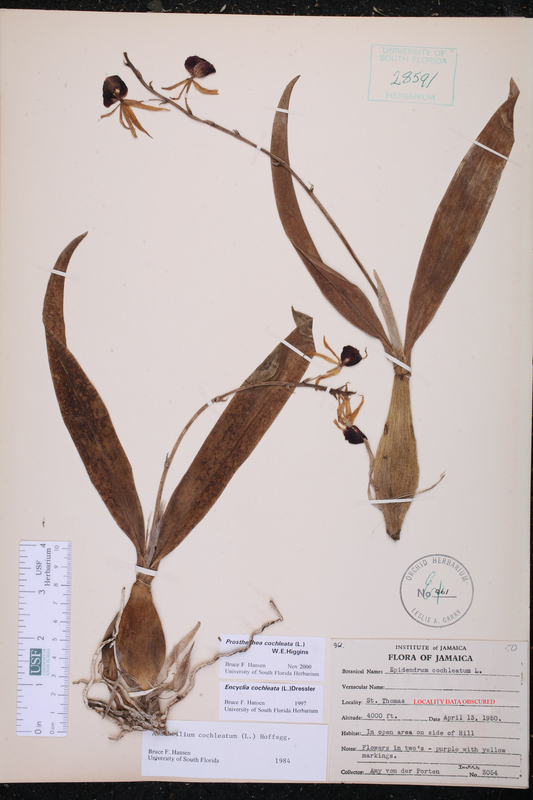 Encyclia cochleata forma albidoflava Encyclia cochleata (Linnaeus) Dressler, forma albidoflava P. M. Brown, N. Amer. Native Orchid J. 1: 132. 1995. 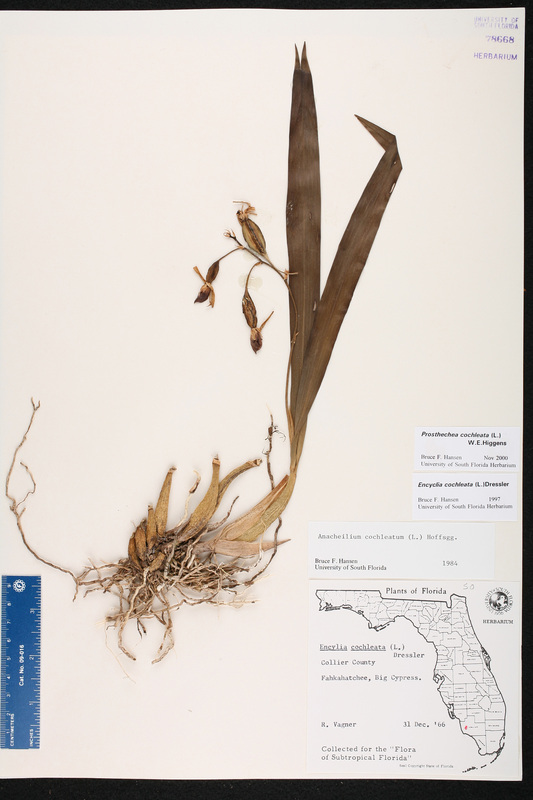 TYPE: FLORIDA: Collier Co.: Without locality, Nov 1967 (holotype: Luer, Native Orchids Florida t. 60(8). 1972). 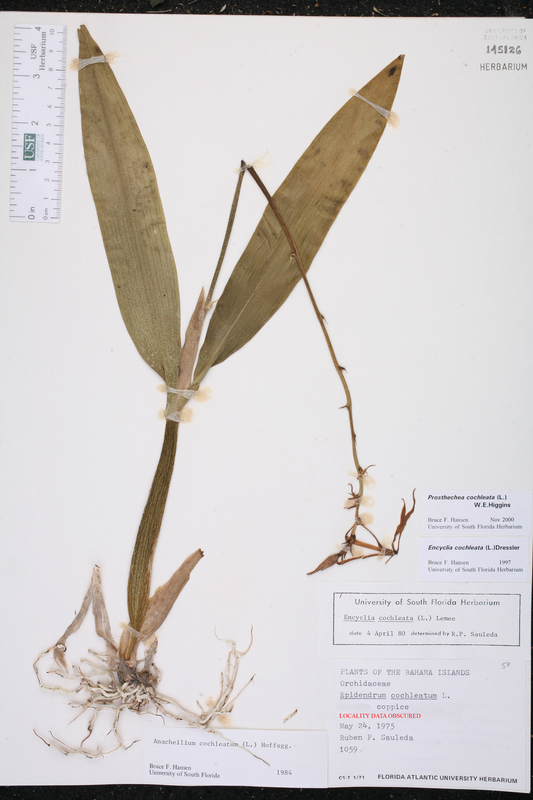 Encyclia cochleata subsp. triandra Encyclia cochleata (Linnaeus) Dressler, subsp. 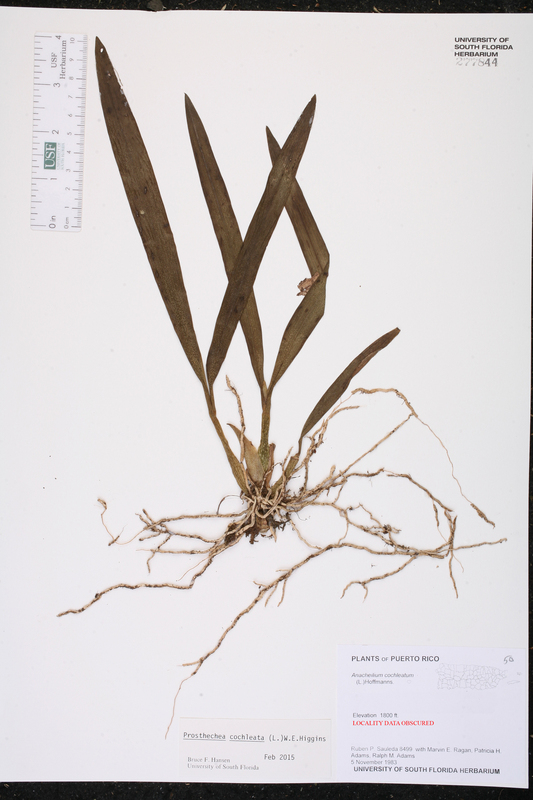 triandra (Ames) Hágsater, Orquidea (Mexico City) 13: 215. 1993. 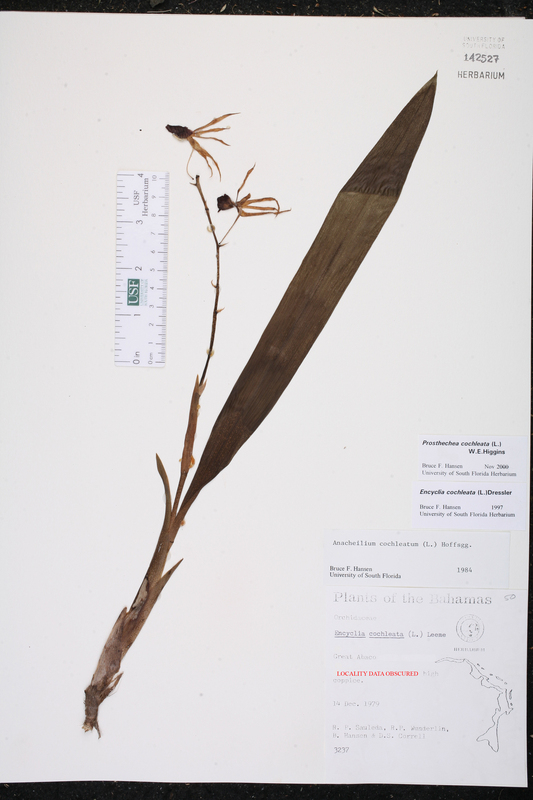 BASIONYM: Epidendrum cochleatum Linnaeus, var. triandrum Ames 1904. 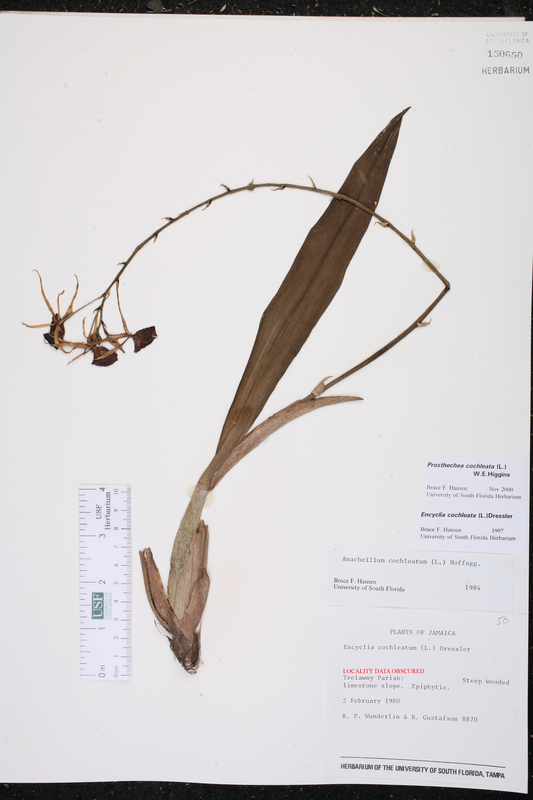 Encyclia cochleata var. 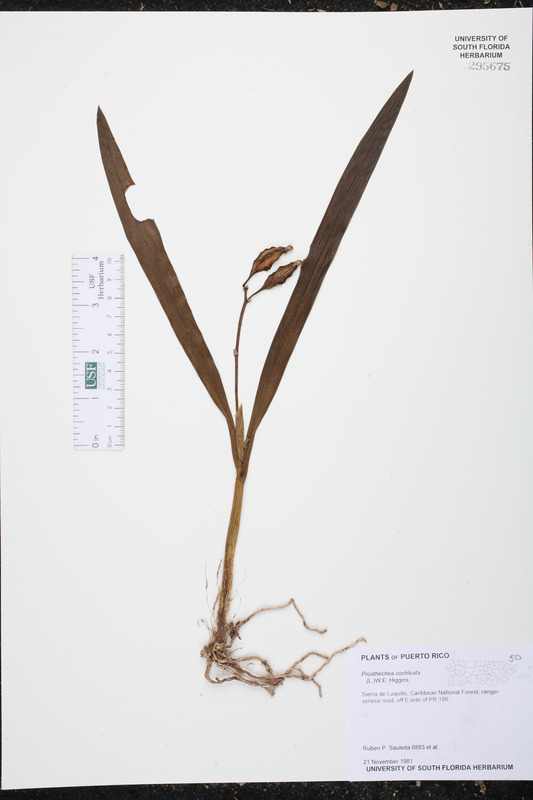 triandra Encyclia cochleata (Linnaeus) Dressler, var. triandra (Ames) Dressler ex Luer, Native Orchids Florida 202. 1972. 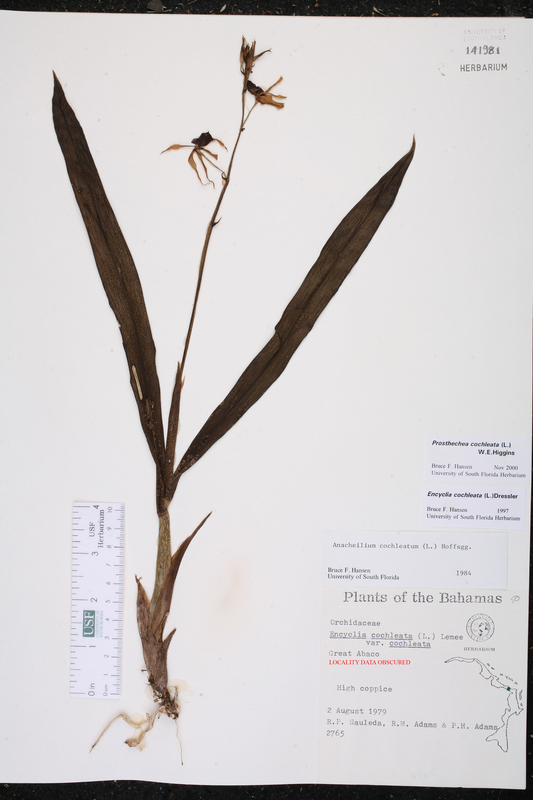 BASIONYM: Epidendrum cochleatum Linnaeus, var. triandrum Ames 1904. Epidendrum cochleatum Epidendrum cochleatum Linnaeus, Sp. Pl., ed. 2. 1351. 1763. TYPE: HAITI: Without data (lectotype: Plumier, Pl. Amer. t. 185(2). 1759). 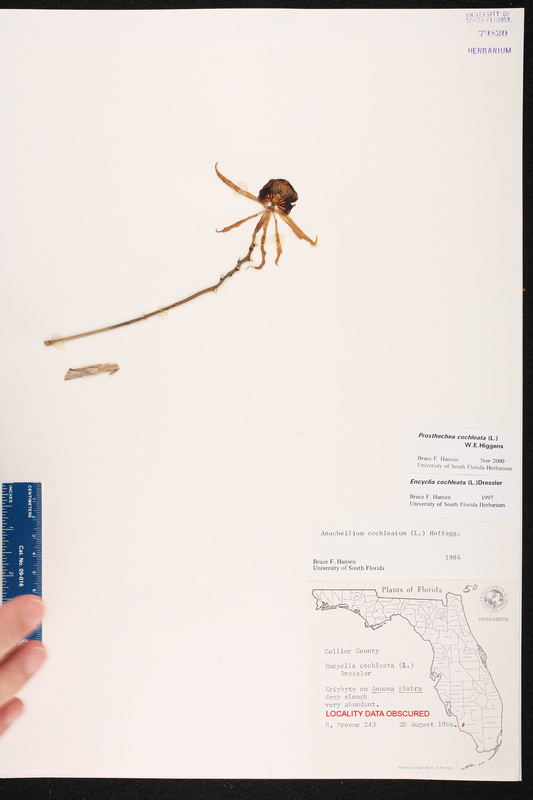 Lectotypified by Garay, in R. A. Howard, Fl. Less. Antill., Orchid. 130. 1974. 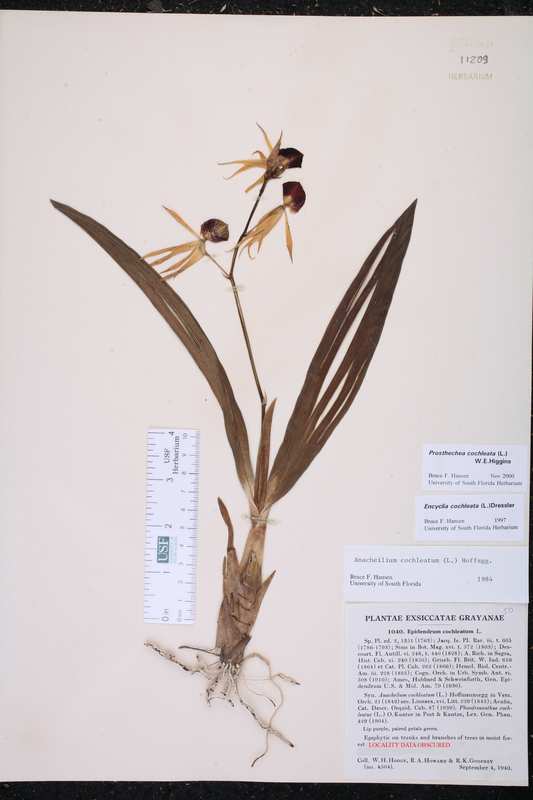 Epidendrum cochleatum var. 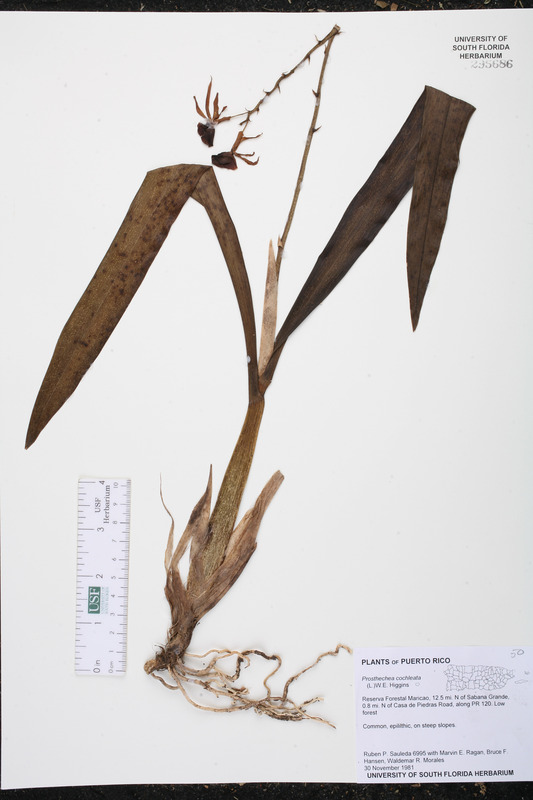 triandrum Epidendrum cochleatum Linnaeus, var. triandrum Ames, Contr. Ames Bot. Lab. 1: 16, pl. 8. 1904. 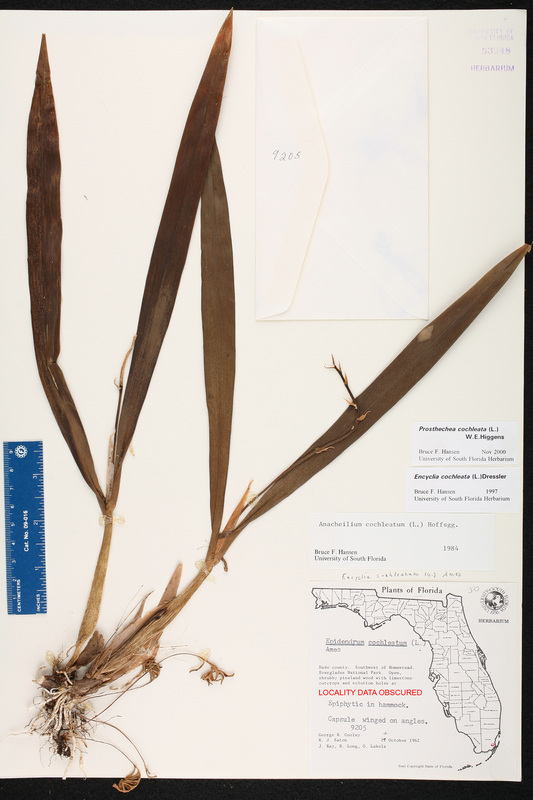 TYPE: FLORIDA: Without data (lectotype: Ames, Contr. Ames Bot. lab. 1: pl. 8. 1904. 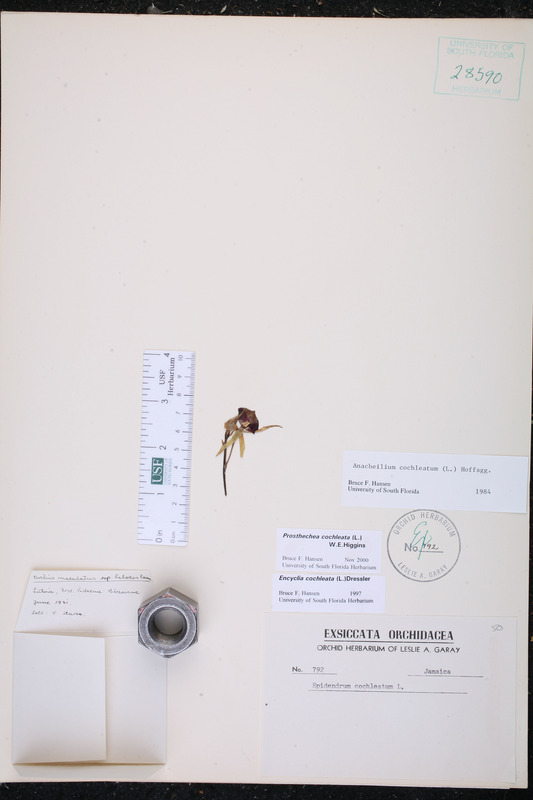 Lectotypified by Hagsater, Orquidea (Mexico City) 13: 215. 1993. Epidendrum triandrum Epidendrum triandrum (Ames) House, Muhlenbergia 1: 129. 1906. 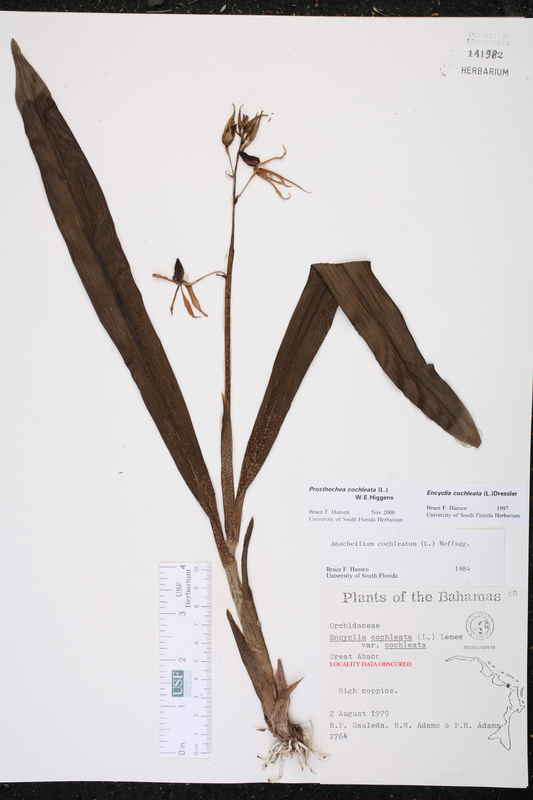 BASIONYM: Epidendrum cochleatum Linnaeus, var. triandrum Ames 1904. Phadrosanthus cochleatus Phadrosanthus cochleatus (Linnaeus) Kuntze, in T. Post & Kuntze, Lex. Gen. Phan. 429. 1903. BASIONYM: Epidendrum cochleatum Linnaeus 1763. 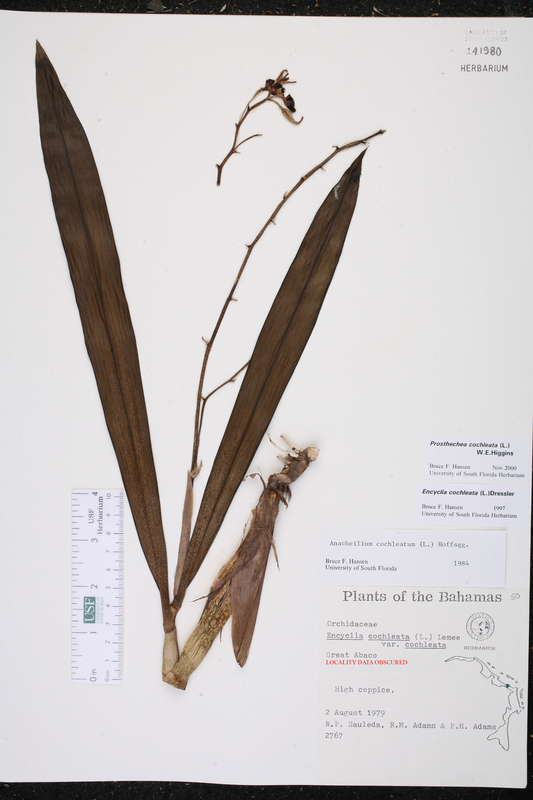 Prosthechea cochleata forma albidoflava Prosthechea cochleata (Linnaeus) W. E. Higgins, forma albidoflava (P. M. Brown) P. M. Brown, N. Amer. Native Orchid J. 5: 18. 1999. 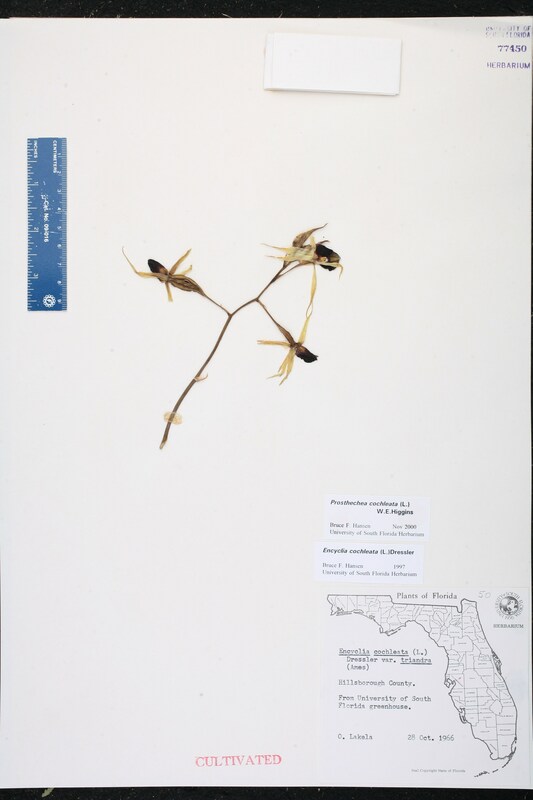 BASIONYM: Encyclia cochleata (Linnaeus) Dressler, forma albidoflava P. M. Brown 1995. 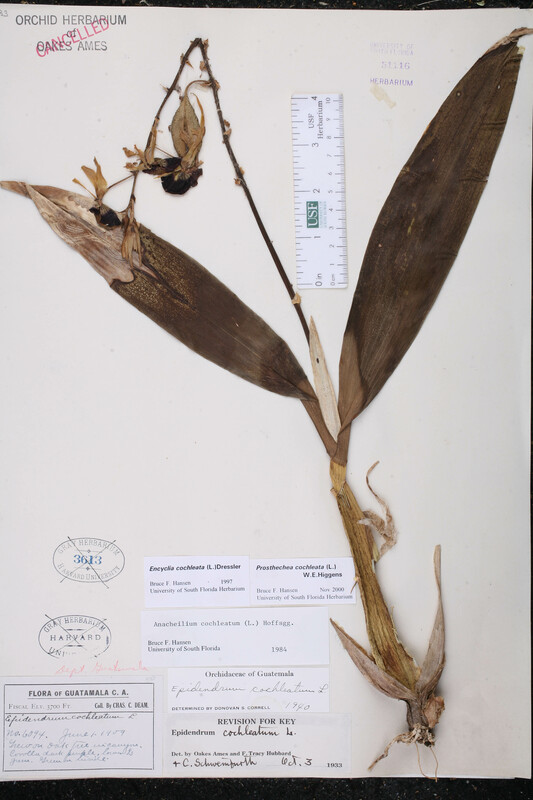 Prosthechea cochleata var. 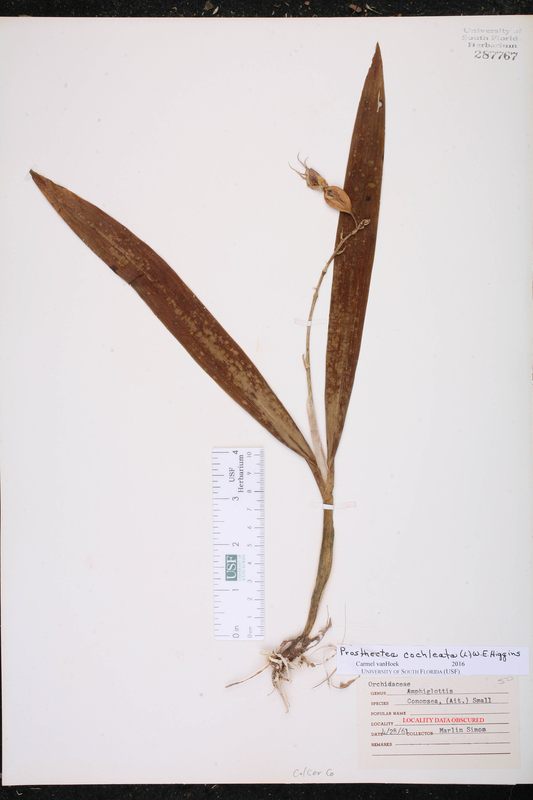 triandra Prosthechea cochleata (Linnaeus) W. E. Higgins, var. triandra (Ames) W. E. Higgins, in P. M. Brown, N. Amer. Native Orchid J. 5: 18. 1999. 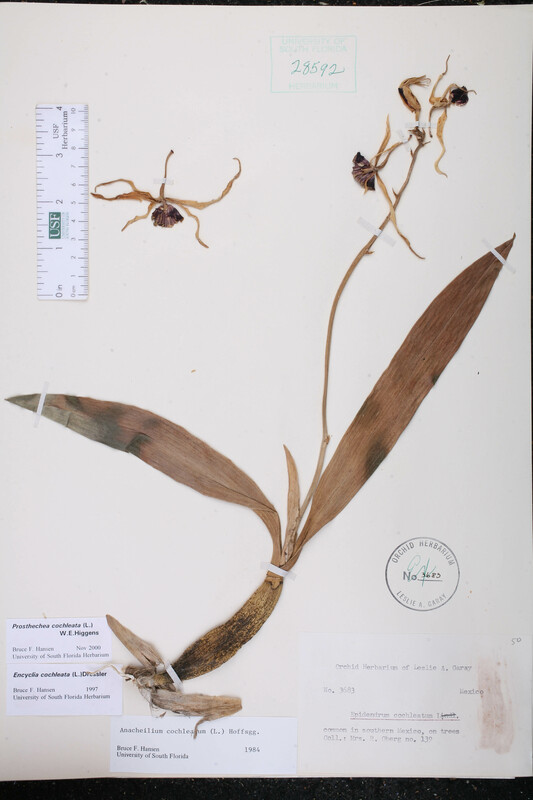 BASIONYM: Epidendrum cochleatum Linnaeus, var. triandrum Ames 1904. 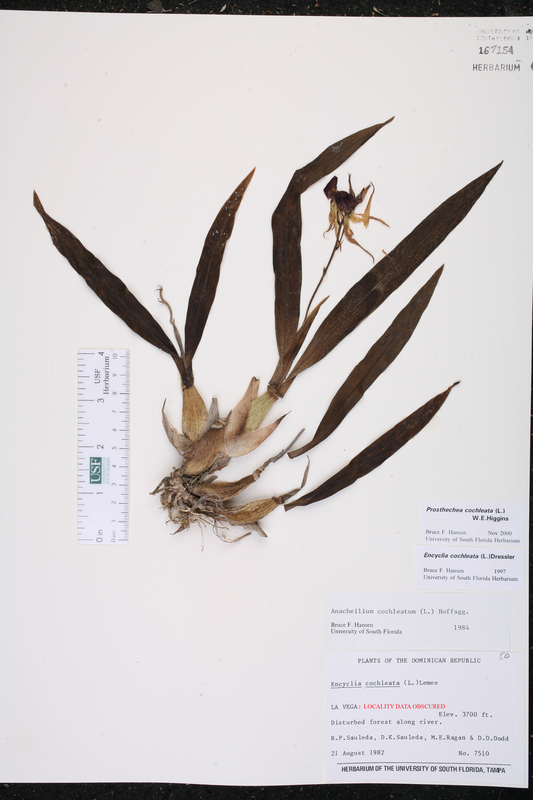 Encyclia lancifolia Encyclia lancifolia (Pavon ex Lindley) Dressler & G. E. Pollard, Phytologia 21: 437. 1971. 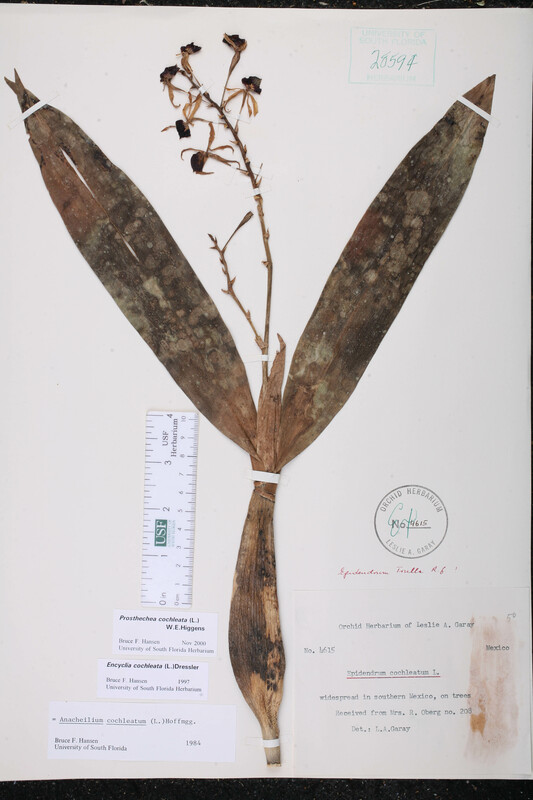 BASIONYM: Epidendrum lancifolium Pavon ex Lindley 1831. 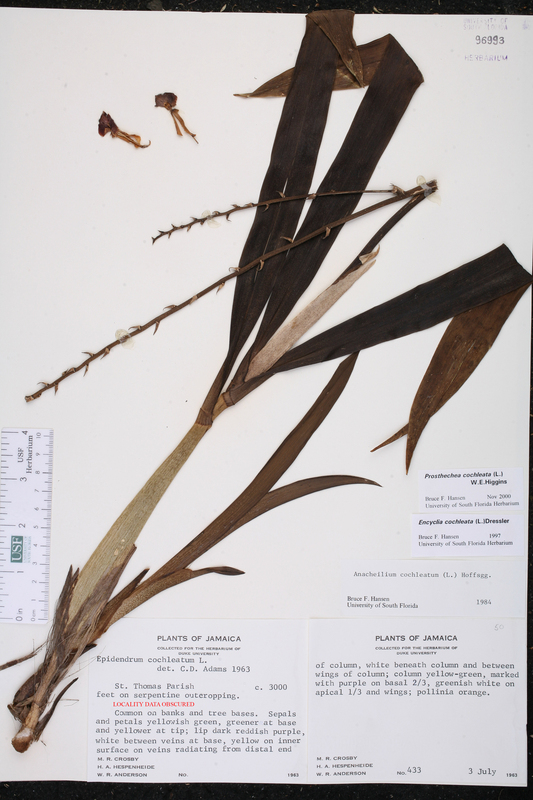 Epidendrum lancifolium Epidendrum lancifolium Pavon ex Lindley, Gen. Sp. Orchid. Pl. 98. 1831. TYPE: MEXICO: Without data, Herb. Pavon s.n. 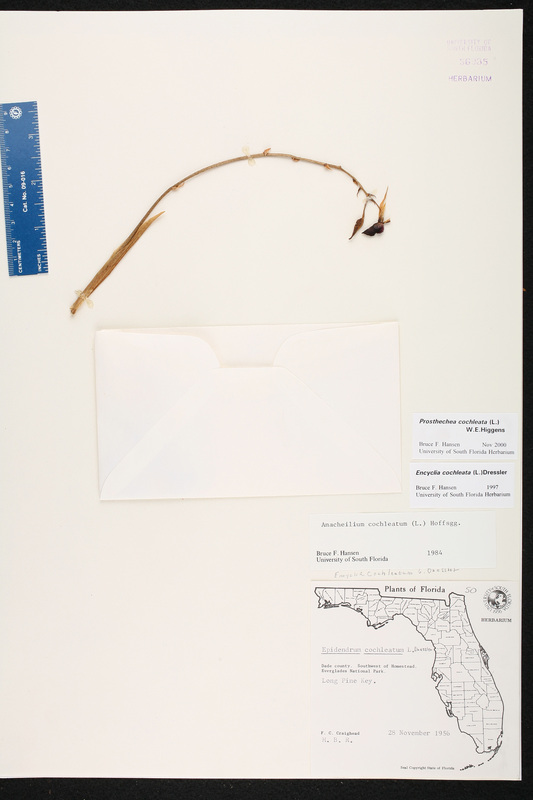 (holotype: BM). USA Florida Miami-Dade Co. 28 Nov 1956 F. C. Craighead s.n. USA Florida Collier Co. 31 Dec 1966 R. Vagner s.n. USA Florida Hillsborough Co. 28 Oct 1966 O. K. Lakela s.n. CULTIVATED. USA Florida Collier Co. 28 Apr 1961 M. Simon s.n. Jamaica s.d. 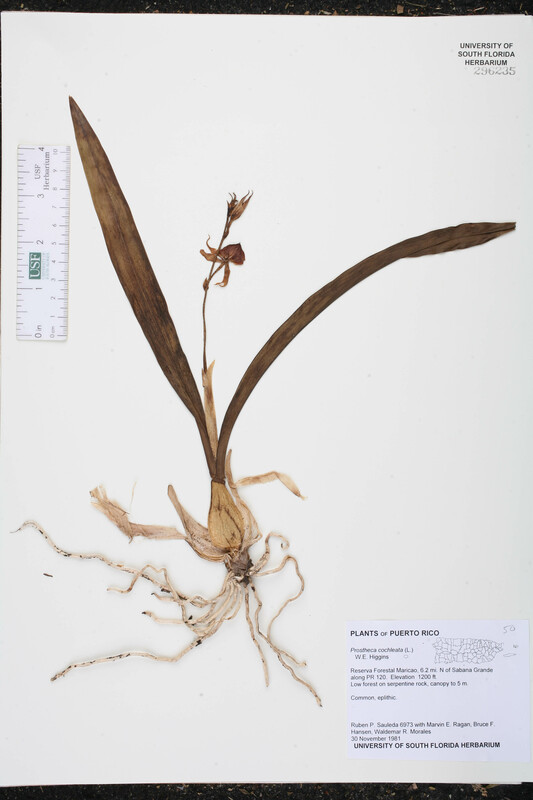 L. A. Garay 792 Packet has written therein: Orchis maculatus ssp. Elodes; Latvia, Prov. Vidzeme: Berzaine; June 1931; coll: K. Starcs.